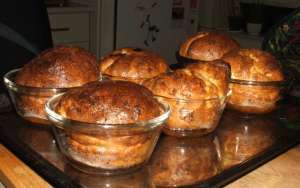 Here is our recipe for popovers (aka Yorkshire pudding). For best results, make sure all of your ingredients are at room temperature - except the oil, which must be very very hot. Traditionally, Yorkshire Pudding was cooked in the roasting pan in the fat thrown from the roast.But nowadays, our meat is really too lean to do that. There just isn't enough fat. So I use olive oil and a little butter for making popovers. And because we love the crispness of the popped part of the pudding, I always make several small puddings rather than one giant one. Use 6 small pyrex bowls and put a good splash of olive oil (some people use the fat from the roast) in each one. Add a small piece of cold butter to each one. It doesn't matter if it's salted or unsalted. Place on a jelly roll tray on the top shelf of a 425F oven to get dishes and oil very hot. If you don't have pyrex bowls, you can use muffin tins. But it's essential to place the muffin tins onto a jelly roll pan to catch the spitting fat. In a bowl, beat eggs well; add milk and salt and whisk together til lightly coloured. Add flour a little at a time using a whisk. Remove tray from oven and quickly add batter to bowls. Fill only to half full!! Return to oven and bake at 425F for 30 minutes. Leave the oven door closed until the pudding is well puffed! Otherwise, the pudding will fall. It's safe to turn the tray around, to account for uneven oven heat, at about the 20 minute mark. This can also be made in the roasting pan to produce one giant pudding - I have only had it once that way... it looked pretty spectacular but some people got saddled with inside portions of the pudding that had no crispy parts. We all like the crispiness of the popped area, so we always make popovers. That way nobody can complain. Serve very hot with vegetables, roasted meat and gravy - LOTS of gravy. to blog from OUR kitchen: Oooooh, popovers! !